1861, 1¢ blue, horizontal pair and four singles, all tied by Washington City circular datestamps on legal-size Rosenthal Regimental patriotic cover with reverse showing all-over design titled "Camp near Fort Ethan Allen, 118th Regt. N.Y. Vols., Col Samuel J. Richards, Commdg. ", addressed to Captain A. Torrance in Hoboken N.J. and endorsed "Boat Princess"; cover with light vertical file fold affecting left 1¢ stamp, F.-V.F., a rare Rosenthal Regimental patriotic design; with 2015 P.F. certificate. Weiss No. RE-L25. Scott No. 63 Estimate $2,500 - 3,500. A series of oversize envelopes with Regimental designs were produced by the L.N. Rosenthal Lithographic Company of Philadelphia, with designs of various Army Camps depicted on the backs of the covers. These attractive and rare designs are highly prized by Civil War Patriotic Cover collectors. They are especially rare postally used, and one contention is that they really were not produced for public use, rather were presentation pieces to ranking officers in the Potomac Army, and their non-typical large size tends to bear that opinion out. 1861, 1¢ blue, rich color, tied by "Paid" in oval handstamp on fresh cover with violet "Lexington, April 19th, 1775 - Baltimore, April 19th 1861" dual American Revolution - Civil War battle scene patriotic design, S.C. Upham imprint on backflap, addressed locally with red "Boston, Mass., Apr 6" cds at center, Extremely Fine; with 2015 P.F. certificate. Scott No. 63 Estimate $1,500 - 2,000. ONE OF TWO RECORDED USAGES OF THIS RARE UPHAM PATRIOTIC DESIGN. 1861, 1¢ dark blue, neat 1862 year date cancel, exceptional centering with well balanced margins encompassing, rich true dark blue color enhanced by a sharp detailed impression, Extremely Fine; with 2015 P.S.A.G. 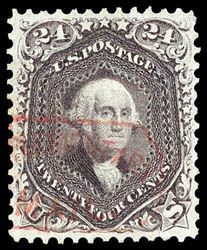 Graded certificate (90, SSV $1,850). 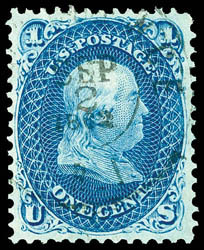 AN EXCEPTIONAL EXAMPLE OF THE SCARCE 1861 1¢ DARK BLUE SHADE - RARELY ENCOUNTERED IN SUCH CHOICE CONDITION. 1861, 3¢ pigeon blood pink, tied on piece by "Brownfield, Me., Nov 1861" balloon town cancel with manuscript day, rich vibrant color, well centered amid attractively balanced margins, Very Fine and choice, a handsome example of this rare and elusive pink shade; with 1992 and 2010 P.F. 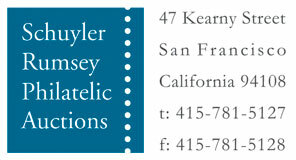 certificates for on cover. 1861, 5¢ N.B.N.C. "Premiere Gravure" in brown, complete design, plate on semi-transparent stamp paper, perf'd and gummed, without gum, rich deep color on fresh paper, typically tight margins, reperfed at right, lovely Very Fine appearance, Scott catalog value for example with small faults, as all original gum examples have faults; with 2015 P.F. certificate (formerly Scott 57). Scott No. 67-E9e $30,000 for o.g. 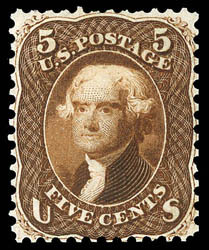 A HANDSOME APPEARING EXAMPLE OF THE 1861 5¢ PREMIERE GRAVURE ISSUE. 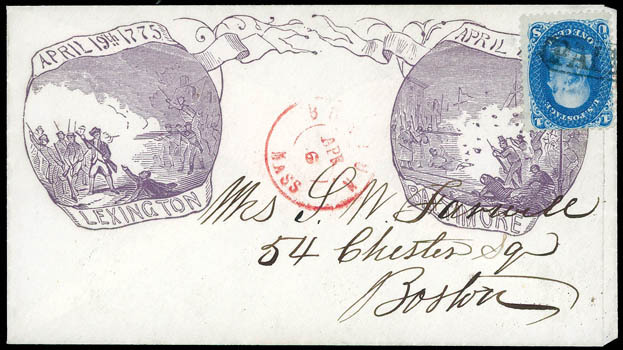 1862, 24¢ red lilac, red "Supplementary Mail" type A cancel, precision centering within well balanced margins, detailed impression enhanced by rich vivid color, Extremely Fine to Superb; with 2015 P.S.A.G. and 2015 P.S.E. certificates both Graded (XF-Sup 95, SMQ $4,750). 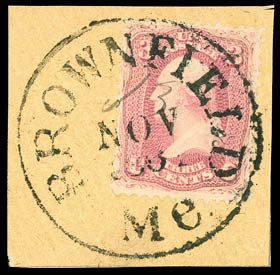 A WONDERFULLY CHOICE 1862 24¢ RED LILAC COMPLIMENTED BY A RED SUPPLEMENTARY MAIL TYPE A CANCELLATION. 1861, 24¢ steel blue, black and red town cancels, beautifully centered amid large margins, rich vibrant color, Extremely Fine; with 2006 P.F. certificate and 2012 P.S.E. Graded certificate (XF 90, SMQ $2,600). 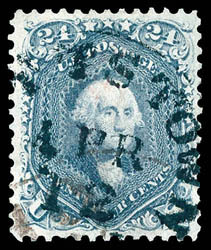 AN EXCEPTIONAL USED EXAMPLE OF THE 1861 24¢ ISSUE IN THE ELUSIVE STEEL BLUE SHADE. It is interesting to note that P.S.E. records thirteen examples of the 14¢ steel blue with this grade and only two examples grading higher (both 95). 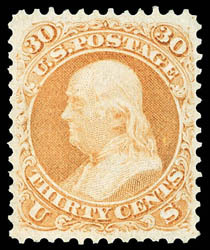 1861, 30¢ orange, o.g., lightly hinged, bright vivid color on fresh paper, exceptional centering, Extremely Fine and choice; with 1991, 2000 and 2011 P.F. certificates, the later Graded (XF 90 XQ, SSV $7,000 for 90). A WONDERFUL ORIGINAL GUM EXAMPLE OF THE 1861 30¢ FRANKLIN ISSUE IN EXCEPTIONAL CONDITION. 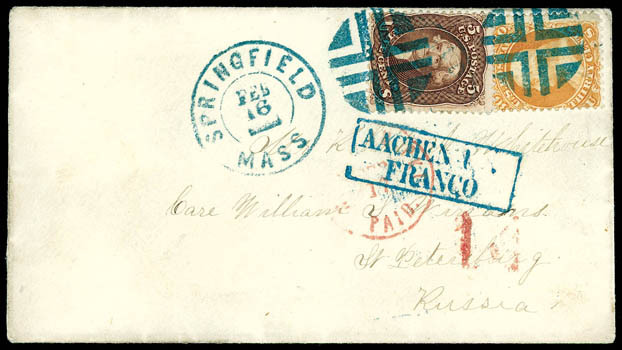 1861, 30¢ orange, used with 5¢ brown (76), brilliant colors, each tied by perfect bold strikes of fancy geometric cross-roads cancel duplexed with "Springfield Mass Feb 16" cds on 1866 cover to St. Petersburg, Russia, partial red "New York Am. Pkt. 'Paid' Feb 17" exchange cds and matching "14" cent credit handstamp, carried by Inman Line City of Washington from New York Feb. 17th to Queenstown arriving Feb. 27th, bold strike of blue "Aachen, Franco 4 /3" framed transit, Extremely Fine and remarkable; with 2015 P.F. certificate. Scott No. 71 Estimate $2,000 - 3,000. A STUNNING 1861 ISSUE USE WITH TREMENDOUS EYE APPEAL TO RUSSIA AT THE 35¢ PRUSSIAN CLOSED MAIL RATE. This cover was prepaid for the 35¢ Prussian Closed Mail rate, with the New York clerk marking a 14¢ credit to Prussia in red crayon. The letter was placed in a closed mail bag for Prussia for the next American-contract steamer. The closed mail bag went through the United Kingdom and Belgium before being opened at the Aachen exchange office on Mar. 4th, where it received the blue boxed franco datestamp to show the date the letter was un-bagged and that it was fully paid. In early 1865, the Aachen exchange office started using blue ink for their markings. 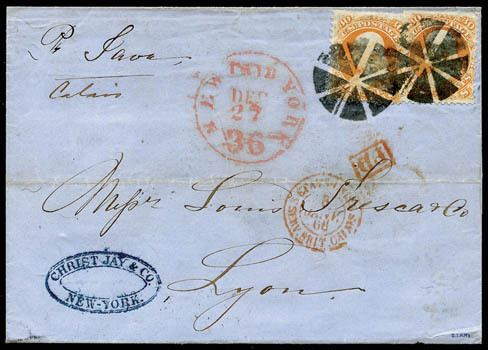 1861, 30¢ orange, two singles, each tied by bold strikes of 6-segment NYFM circle of wedges fancy cancel on blue folded 1865 cover to Lyon, France, red "New York 'Paid 36' Dec 27" exchange cds, carried as endorsed by Cunard Line Java from New York Dec. 27th to Queenstown arriving Jan. 5th, red Calais (1.8) entry cds with matching small "PD" framed handstamp, reverse with Paris (1.8) transits and Lyon (1.9) arrival cds; light horizontal fold, a Very Fine and choice use. Scott No. 71 Estimate $750 - 1,000. This cover was prepaid 60¢ for four-times the 15¢ treaty rate, but actually credited 36¢ for three-times the 12¢ British transit fee. This six-segment NYFM circle of wedges cancel shows one wedge with a distinctive additional segment.